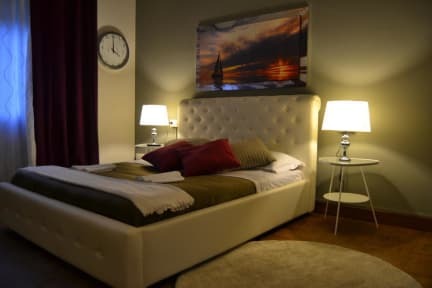 The Guesthouse is located in a excellent position because you can reach Piazza Maggiore in 10 minutes and in 20 minutes walking you will be able to reach the main Bologna Train Station. In a few minutes you will reach the famous Bolognas towers (Garisenda and Asinelli’s towers), Nettuno’s fountain, the ancient and historical University and all his numerous churches. Its centrality will allow you to enjoy the famous Bologna night life: bars, pubs with live music, trattorias (where you can try the real Italian tortellinis), restaurants, pizzerias are really close. Our rooms offer comfortable beds (linen and towels always cleaned and perfumed) in colorful, bright and elegant rooms with a modern furniture. Every room offer many facilities such as sofa, flat TV, teakettle, Free WiFi. Moreover we offer you a delicious continental free breakfast and, if you come by car, you can leave it in a parking a few minutes from the structure. Taxes not included - occupancy tax 1.00 EUR per person per night if the price of the total staying is less than € 49,00. If the price is more than € 49,00 the occupancy tax rise at 1.50.